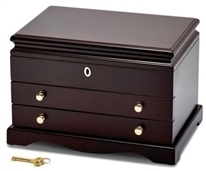 The name mahogany is used when referring to numerous varieties of dark colored wood, originally from the species Swietenia Mahogani, known as West Indian or Cuban mahogany. 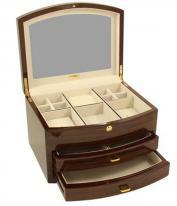 Our mahogany jewelry boxes and chests feature exquisite details and design. 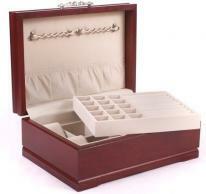 A mahogany jewelry box has a generally strait grain and is free of voids and pockets. 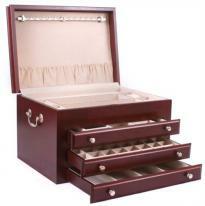 It has a reddish brown color that darkens over time and displays a beautiful reddish sheen when polished. 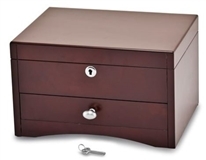 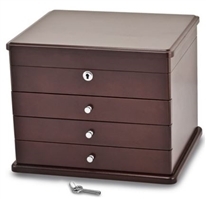 All mahogany jewelry boxes and chests qualify for easy 30 day returns and 1 year product warranty.